There are lots more things we could add, but here are some of my favourite ways to spend time (and not much money)! 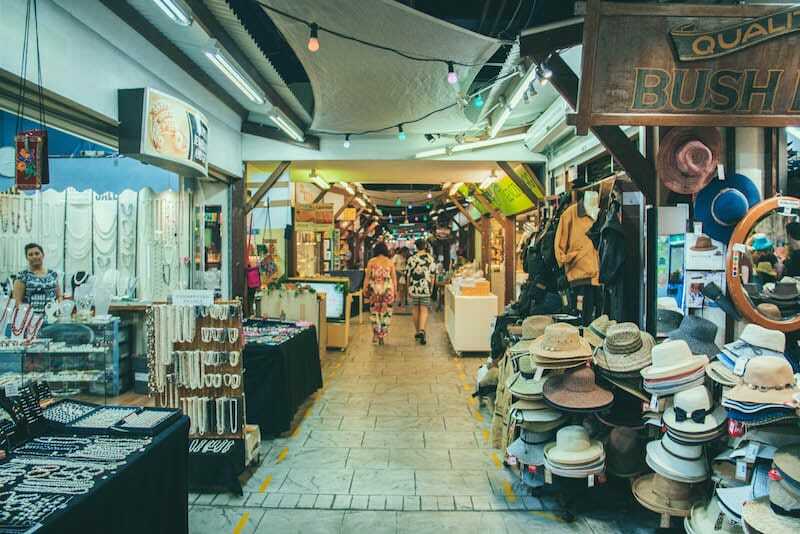 Like many towns in Australia, there are some great markets in Cairns, my favourite being the night markets. So instead of wasting all of your money on beer why not buy a few reasonably priced souvenirs for yourself or your family back home. When I was there you could choose an oyster which they would open up for you so you could see what kind of pearl was inside. This is a great gift and my Mum made a nice necklace out of the pearl I sent her. I probably shouldn’t have sent the oyster shell too because it was a bit stinky when it arrived in the UK. You can also find some very tasty and cheap food at the night markets! For cheap fruit and veg make sure you visit Rustys Markets. It’s cheap, smells amazing and there’s enough fruit samples to easily provide a healthy and free breakfast! Okay, so this free activity is not for everyone… but one of the things I missed most when travelling was having the money to afford a gym pass. 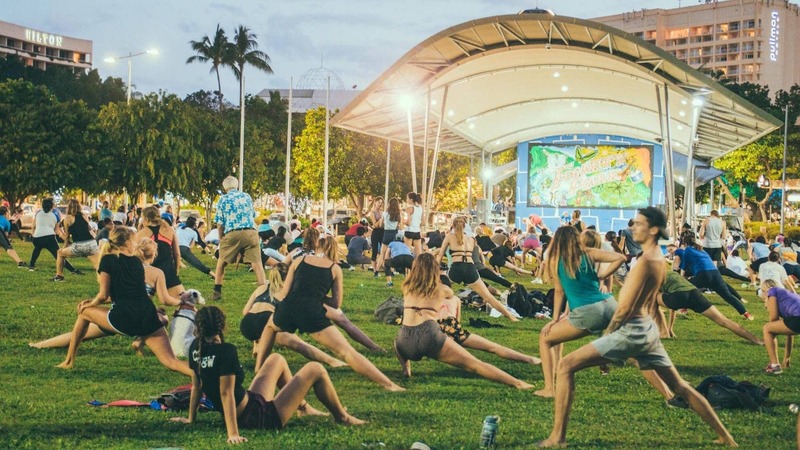 Every day of the week there are free fitness classes on the Cairns esplanade waterfront. These include Yoga, Boxing, Aqua Zumba in the Lagoon, Beach Volleyball, Pilates and Bouldering. You can see the class timetables here. Cairns has a surprising number of art galleries. Well, I was surprised because when you’re thinking of Cairns it’s not the towns art and culture that first pops into your mind. The Art Galleries are free to get in because they want you to buy something. 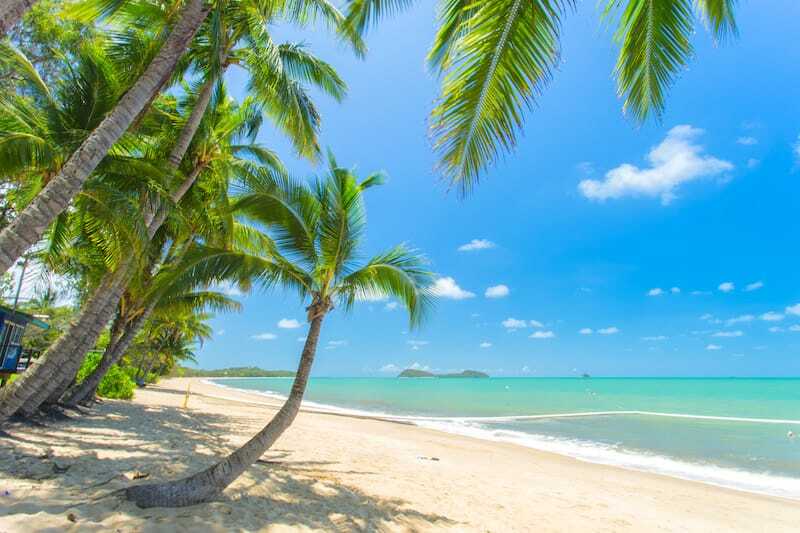 You’ll see some spectacular images of Cairns, The Great Barrier Reef and also images of some of the places you’ll have visited during your time in Australia. 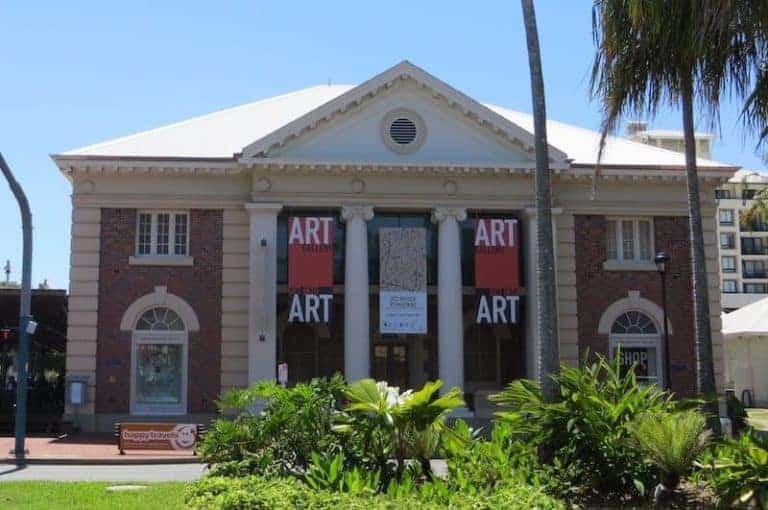 One of the most popular is the Cairns Regional Gallery in the town centre. View current exhibitions here. 4. Check out the rainforest! If you want to check out our beautiful rainforest there are some excellent options. You can visit the Cairns Botanical Gardens which has many walking trails. 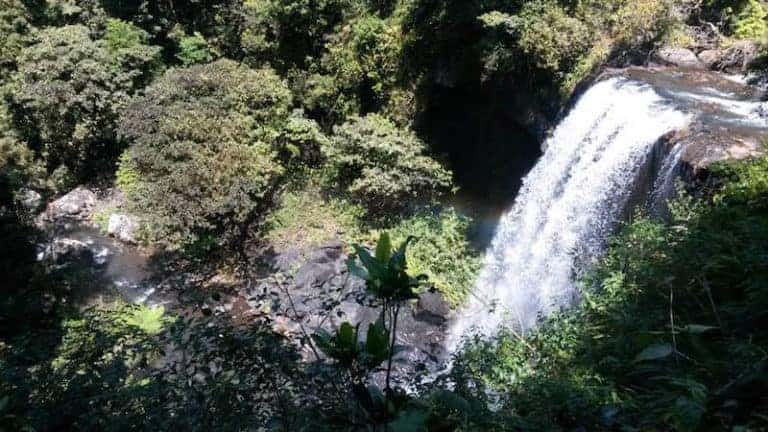 The Red Arrow walk takes only about 30 minutes to complete and will take you through the gorgeous rainforest to a spectacular lookout at the top, make sure to take your camera. The Blue Arrow is similar but a harder and longer track that is 5.4km long with a few steep ascents. The heat in Cairns can sometimes become unbearable so what better way to cool off than in a huge, well-maintained outdoor swimming pool? 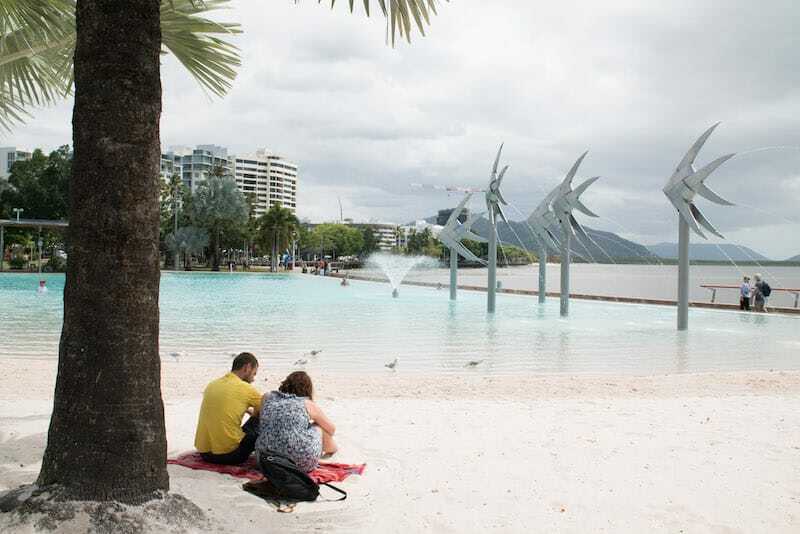 Located on The Esplanade in central Cairns is ‘The Lagoon’ and it really is a nice place to relax and wile away the day. Most Sundays the Lagoon also plays host to live and local music on a pop up stage. A perfect way to overcome an inevitable Woolshed hangover. If the tropical heat hasn’t knocked you out completely, you can also enjoy a scenic stroll along the Esplanade boardwalk that begins at the Lagoon. This has to be the most popular out of all of the free things to do in Cairns. 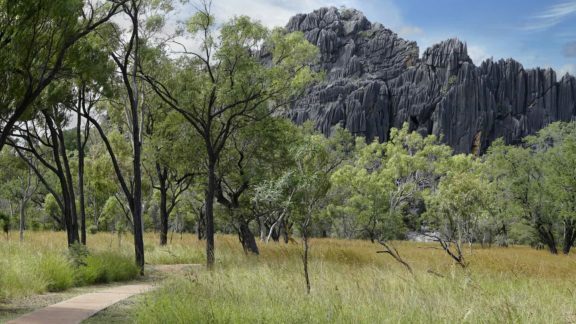 Just a short drive from Cairns, you will find the world’s tallest natural pyramid. The hike to the top of the mountain and back should take you around 4 to 6 hours. From the top you will be rewarded with 360 degree views of Cairns and the surrounding rainforest. Get a bunch of friends together and hire a car for the day! We’re really lucky that there are some beautiful waterfalls very close to us. Crystal Cascades is a local hot spot near Cairns and is just a short 20 minute drive from town. You could actually ride a bike there if you are fit! 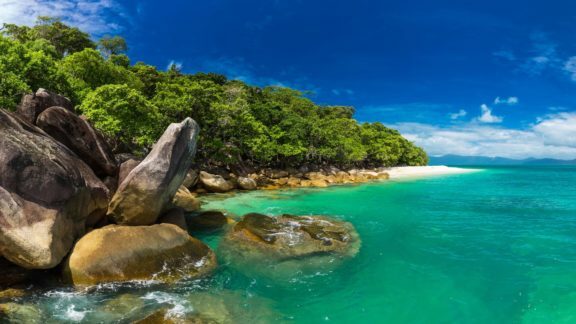 There are loads of natural swimming holes nestled within the Rainforest, a perfect way to escape the heat! Stoney Creek Falls are also a popular local hot spot. The Falls are located around 8km from Cairns (just beyond the airport) and there are loads of rock jumping spots and fresh water swimming holes. A drive to Atherton Tablelands to see Millaa Millaa Falls is also a must (where Peter Andre filmed his hit song Mysterious Girl). Imagine a gigantic, inflatable, bouncy water park for adults in the middle of tropical Australia. Aqua Park is just a short drive from Cairns and you can buy a 50 minute session for just $15, or 2 X 50 minute sessions for $20. Find out more here. 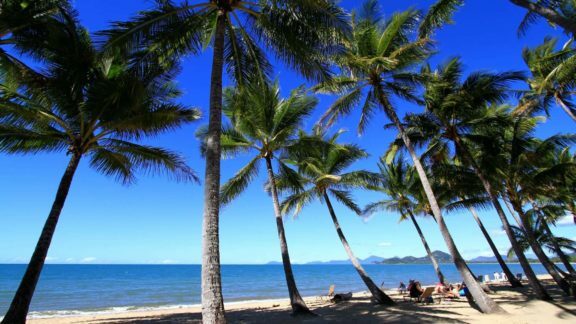 Cairns Northern Beaches are absolute paradise – Palm Cove and Trinity Beach are my favourites. If you don’t fancy hiring a car then get the bus to Palm Cove, which is 45 minutes away. The bus takes about an hour. You can view the Sunbus timetable here. No visit to Australia is complete without a visit to the stunning World Heritage Site of The Great Barrier Reef. Cairns is an excellent place to be to get on a boat and see it for yourself. But how on earth can a visit to The Great Barrier Reef out of Cairns be considered a cheap thing to do in Cairns never mind a free one? 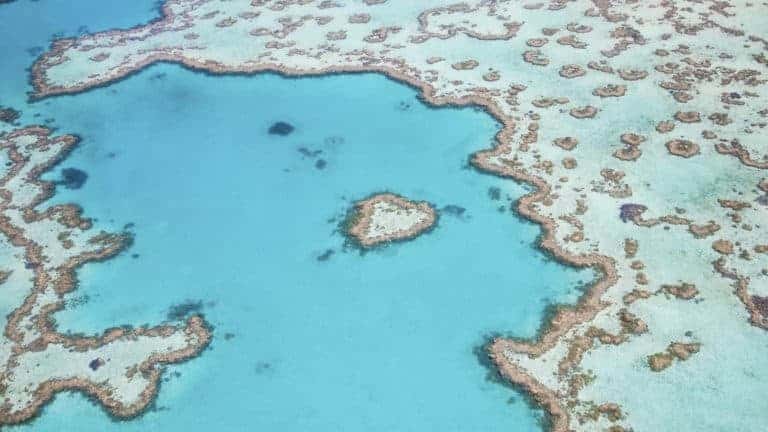 Of course it depends on what your definition of cheap is, but you can book yourself on a day trip to The Great Barrier Reef from as little as 109AUD. Visiting The Great Barrier Reef for free! It is possible to visit the spectacular Coral Reef for absolutely nothing. To do this requires a bit of cunning and / or a bit of luck but it can be done. Cairns has lots of bars catering to the backpacker market. This means heaps of nightly activities where, for a temporary loss of your dignity, you could find yourself the proud winner of a trip to The Great Barrier Reef on one of the many boats that departs Cairns on a daily basis. Alternatively you could become a “hostie” meaning in exchange for some work you could be out on the reef for free. I can vouch for the fact that being a hostie is definitely a fun job. Or search for a job in Cairns here. 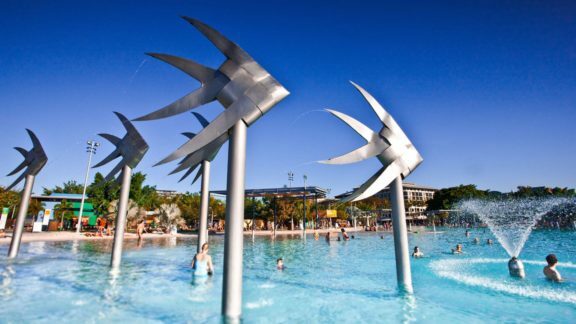 If you have a bit of cash then check out this list of must do things in Cairns too! For up to date information on special offers, discounts and more, speak to the staff at your hostel. 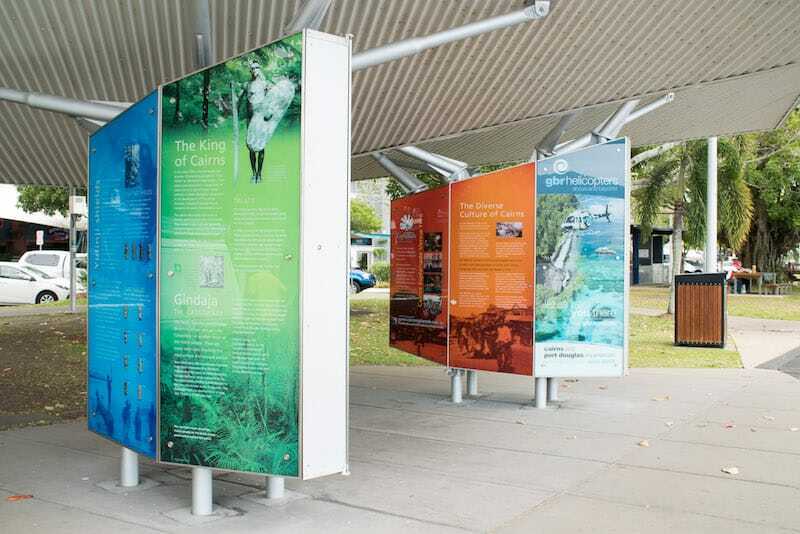 You’ll find that they’ll have a comprehensive list of everything you need to know about Cairns and the surrounding area. All prices correct as of February 2018. Thanks for the information. We’ve been there and you are completely right. Cairns and surroundings don’t need to be very expensive. You need to be more flexible and you will save some money. The Red and Yellow arrow walking tracks are fantastic, close to the city and free.